From their initial introduction a few years ago we’ve seen voice activated Smart Speakers such as the Amazon Echo, Google Home Smart Speaker and Apple’s planned HomePod see an increasing uptake from consumers - in fact according to a recent report from NPR and Edison Research as many as one in six US adults now own one. Naturally when any new technology medium starts to see prominence it makes sense to understand its users behaviours and preferences - and in our case as a consultancy focused largely on Brands in Entertainment, where the opportunities might be for our clients. 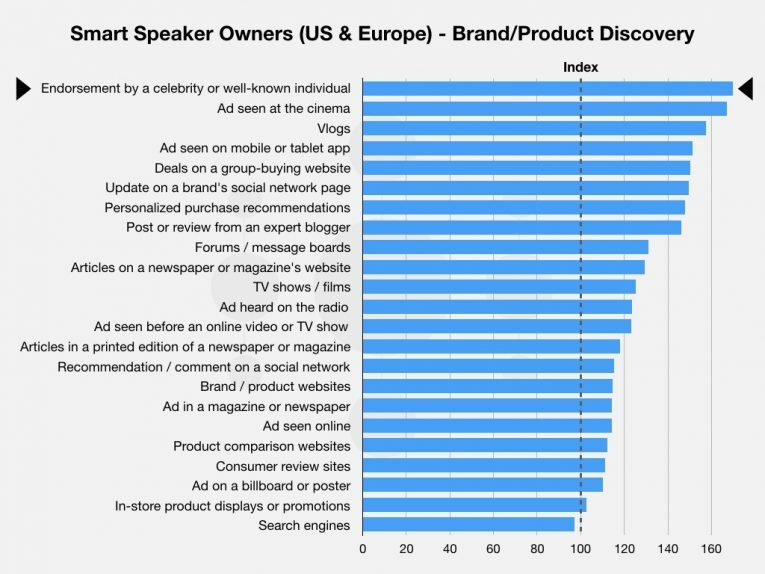 Our first step in understanding this new Smart Speaker audience was to learn how they discover new brands and products. 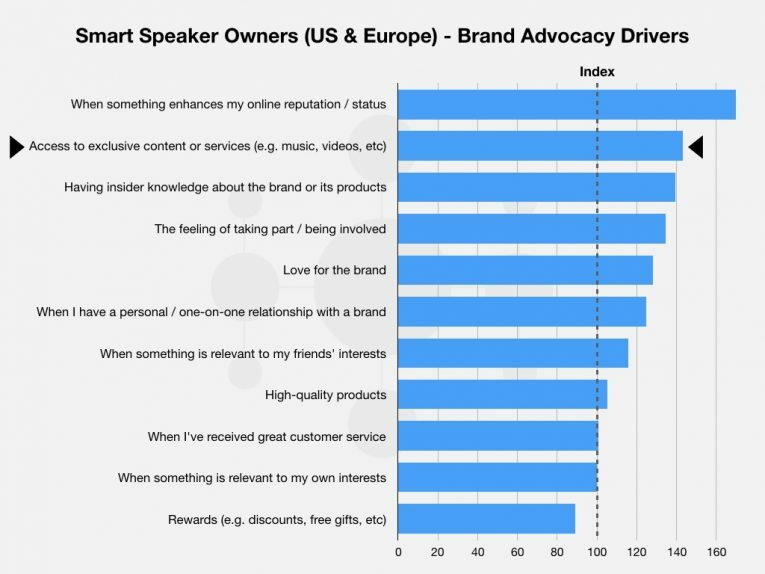 Using data from Global Web Index for US and European audiences we discovered that compared to the average for these regions, Smart Speaker owners were much more likely to discover new brands and products as a result of Celebrity Endorsement. Even more interesting to us was that Celebrity Endorsement was seemingly most effective for the highest earning groups of Smart Speaker owners too - with the Top 25% earners over indexing here significantly. 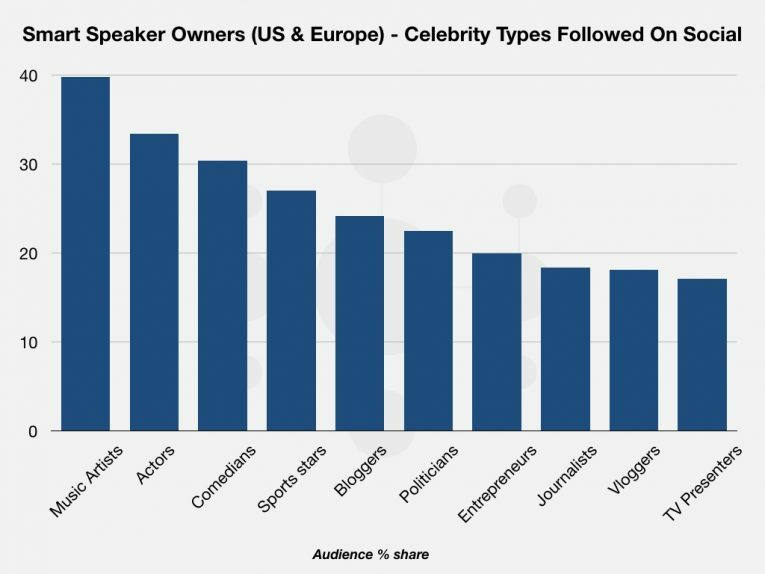 Since we now understood celebrities played a key role in engaging affluent Smart Speaker owners we also used GWI data to examine the types of celebrities most followed by this audience on social media in order to get a sense of their preferences. The data revealed that music artists saw the most interest here, with the most interest in these coming from under 25’s and also a significant interest from 25 - 35 year olds too. Naturally if we see a preference for music artists who might play a role in celebrity endorsement it is very useful to identify both the genres and specific artists that the target audience most favour. GWI online panel data suggested an above interest in Hip Hop for this group - however we at EntSight have a tool at our disposal which can also identify such preferences using social media conversation data, our proprietary solution called Constellation. 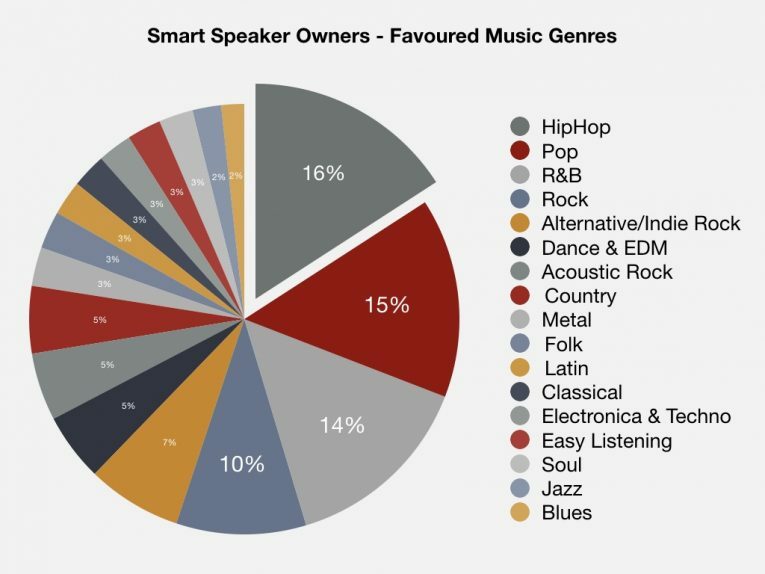 Using a sample audience of social media users who we identified as owners of Smart Speakers we used Constellation to identify the genres most talked about by this group. As suggested by the GWI data we certainly saw a prominent interest in Hip Hop here, and so the next question we considered was - exactly which artists in the genre might be most favourable to this Smart Speaker audience group? 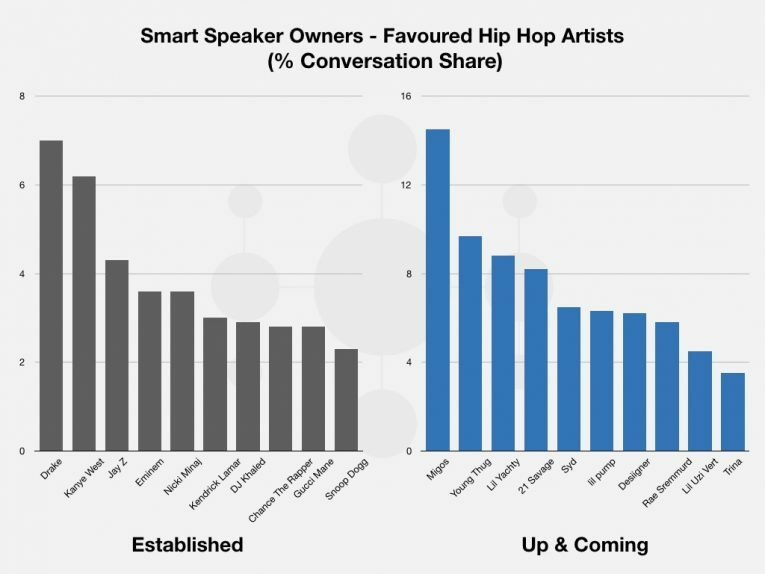 Analysis of audience preferences using Constellation confirmed that, as far as established Hip Hop artists were concerned, Drake saw the most interest from our group of Smart Speaker owners as well as a very high share of positive sentiment. When it came to up and coming artists, Migos saw the most interest from the group - with the most prominent topic being an online petition for the Hip Hop trio to replace Lady Gaga at the 2017 Super Bowl. 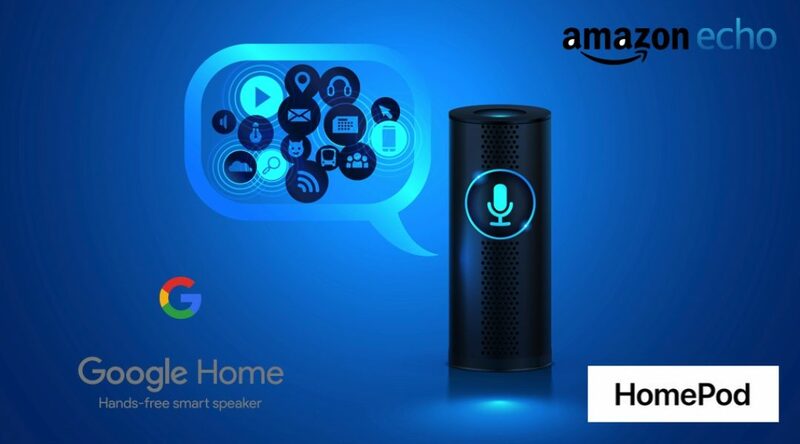 When you consider the fact that Smart Speakers are a medium where music plays a very prominent role, the opportunities for brand activations and campaigns using artists are both myriad and exciting for entertainment marketers. One option we though could be very engaging for the audience would be brand sponsored exclusive tracks delivered via the device - an approach which is verified by data from GWI which suggests this kind of exclusive content would drive significant brand advocacy from Smart Speaker audiences.